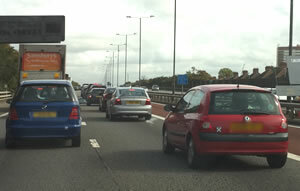 The Highways Agency are giving advance notice of forthcoming road work on nearby stretches of the M4. The M4 eastbound will be closed between junctions J3 and J1, due to roadworks, between 10 pm and 5 am, from 12 November 2012 to 16 November 2012. The M4 westbound will be closed between junctions J1 and J3, due to roadworks, between 10 pm and 5 am, from 19 November 2012 to 23 November 2012.